The Department of Mathematics had organized a condolence reference to pay tribute to the Great Mathematician Prof. Dr. Ghulam Mustafa Habibullah, Ex-Chairman on Thursday February 22, 2018 at 11.30am in the Department of Mathematics. 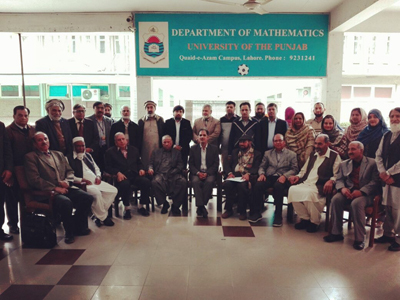 The Chairman, Department of Mathematics, Prof. Dr. Muhammad Sharif gave a brief introduction of Prof. G Mustafa and recognized his meritorious services. Many mathematicians who were his colleagues and companions also expressed their experiences and feelings about Prof. Mustafa. His daughter and son-in-law were also invited. Her daughterexpressed her feelings and told about the routine life of her father. He mentioned that her father was very kind and always encouraged others for new ideas for the betterment of education, research and society. He helped the poor and respected them.